Ellie decided to do some Lego work today. 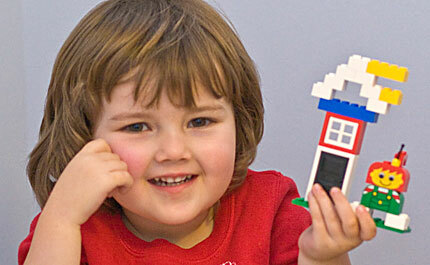 But since she's new at it, her attempts to build a house were frustrating. "Ohhhhh. I just don't know how to build a house out of these Legos [she actually calls them dominoes]. Oh I know! 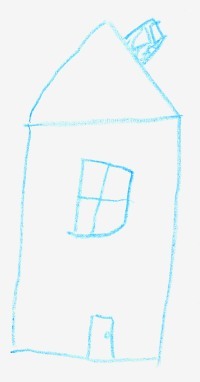 I'll draw a picture of what a house looks like and then I can look at my picture and know how to build a house!" "What an excellent idea," respond her parents. After building the bottom bits, she was studying her drawing and said, "But I just don't know how to build a roof...." However, undeterred she kept at it and out popped this bit of construction work, as per the architectural drawings. Complete with the chimney at a bit of an angle. (Ok, well the builders did improvise a bit and add a second chimney). Meanwhile, Isla is crawling up a storm. One knee, one elbow, a scooting technique, and off she goes. The main draw for Ellie to crawl was to knock over towers of blocks. While Isla enjoys that sport, her main draw is anything with wires or buttons. Here's the stretch for Crystal's computer power cord. Then there are the awkward falls flat onto your head that make you look back at Daddy with his camera and say, "Put that thing away!" Sometimes sitting up and kicking back are safer and more relaxing.